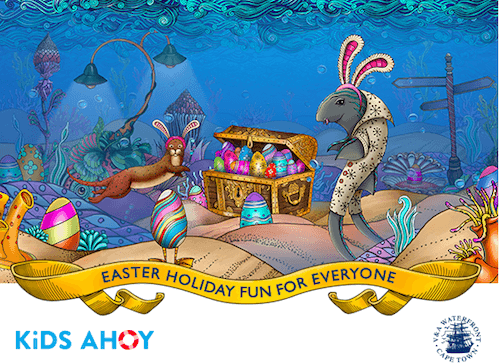 The V&A Waterfront Kids Holiday Programme Easter 2016 will keep your kids entertained these school holidays. For the autumn school holiday, the V&A Waterfront has unveiled an indoor children’s programme sure to keep little hands and minds occupied while having fun. During the Easter holidays 2016, a great combination of free and affordable activities will be on the go daily from 10am. At the Waterfront’s Kids Ahoy play zone in Quays Square, various See Saw Do workshops will introduce kids to the fun side of cardboard games. Children can interact and co-create interactive cardboard games and play for hours designing games and toys with their newfound friends. At the Amphitheatre, the Shakespeare School Festival will offer a sneak preview for what is coming later in April when from 18 - 21 April 2016, several Cape Town schools take part in the competition at the Baxter Theatre. More about the Festival. On the croquet lawn, in front of the Springbok Experience Rugby Museum at the Waterfront, the Galileo Open Air Movies will present the popular family movie 'Big Fish' on 31 March 2016. Other family-friendly activities include favourites such as the Wheel of Excellence, the Jolly Roger pirate boat, the Thomas the Tugboat cruises or digging for a treasure at Scratch Patch and the very popular Cave Golf and not to forget the amazing exhibits at the Two Oceans Aquarium. If you want to treat your kids to some chocolate delights, make sure to stop by at the pop-up Lindt store with photo opportunities with a huge Lindt bunny at the centre court at Victoria Wharf shopping centre. And meet the Easter Bunny between 11am and 3pm on Friday 25 March 2016 at the centre court. Enjoy the activities at the V&A Waterfront! More details on the Kids Ahoy! programme. More info on the Waterfront on ExpatCapeTown here.